Discussion in 'Articles' started by xcel, Feb 14, 2009. 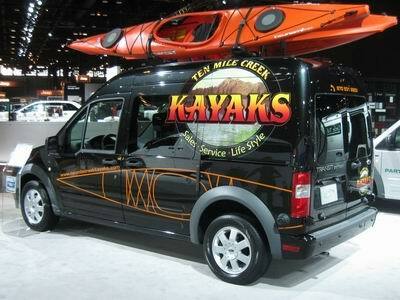 10-Mile Creek Kayak’s brand new Ford Transit Connect. 2009 Ford Transit Connect is rated at 22/25 city/highway on the 08 EPA. What we did not expect however was to have a front row seat to a somewhat emotional and by far the best presentation at the Chicago Auto Show. 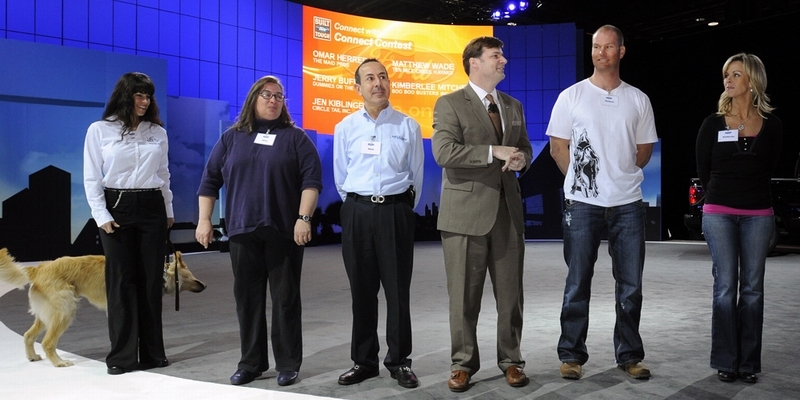 Jim Farley, Ford’s group VP of Marketing and Communications introduced 5 small-business owners as winners of customized, work ready Transit Connects setup for their specific businesses. Immediately afterwards, the 5 brand new Transit Connects with sharp exterior graphics were presented. After the vehicles were driven on stage, the new owners gave an emotional testimonial about how the utility of their new vehicles will help their businesses prosper. [xfloat=left]http://www.cleanmpg.com/photos/data/507/Boo_Boo_Busters_2.jpg[/xfloat]Boo Boo Busters -- Ladera Ranch, CA. Kimberlee Mitchell wants to make the world safer for babies, and she’s succeeding – one house at a time. 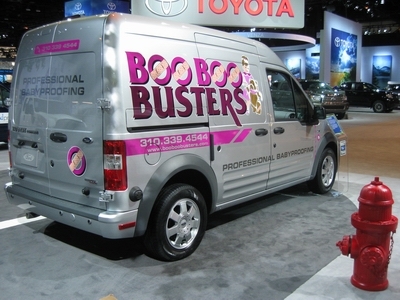 The owner of Boo Boo Busters, a full-service babyproofing company, will help her company not only better manage inventory, but also get the job done quickly and efficiently. In the case of Boo Boo Busters, motherhood was the impetus behind the birth of the business, Mitchell said. After her first child was born, she realized her house seemed almost booby-trapped with items dangerous to children. Since she couldn’t find the help she needed, she used her journalism background, did her research, and started a company of her own. Her services, she soon found, were in great demand. Her dream? To end the unintentional injuries that occur in homes that are not properly babyproofed. The Transit Connect, she said, will help bring her that much closer. Kimberlee’s Transit Connect was outfitted with custom shelving of every size to hold tools, hardware and of course Babyproofing supplies. [xfloat=left]http://www.cleanmpg.com/photos/data/507/Circle_Tree_2.jpg [/xfloat]Circle Tail, INC. -- Pleasant Plain, OH. Jen Kiblinger’s life has gone to the dogs – and she couldn’t be happier. As vice president of Circle Tail, Inc., a nonprofit organization that provides high-quality assistance dogs to people with mobility, hearing, neurological and psychiatric disabilities, Kiblinger spends much of her time transporting cargos of active canines. Owning a Ford Transit Connect, she said, will ease many of the complexities the group faces on a daily basis. Circle Tail, Inc., founded in 1997 by Marlys Staley, also provides dog adoptions, obedience training and boarding. It’s one of those rare entities that benefits both people and animals, said Kiblinger. But all those trips back and forth in the group’s old minivan have taken their toll. The Transit Connect, said Kiblinger, is a perfect solution – from its size to its maneuverability. Jen’s Transit Connect was outfitted with a large number of dog crates and shelving to store dog supplies including collars, leashes, toys and dog food of all types. [xfloat=left]http://www.cleanmpg.com/photos/data/507/Dummies_on_the_Run_2.jpg[/xfloat]Dummies on the Run -- Ann Arbor, MI. Jerry Buffman, owner of Dummies on the Run, is one smart cookie. 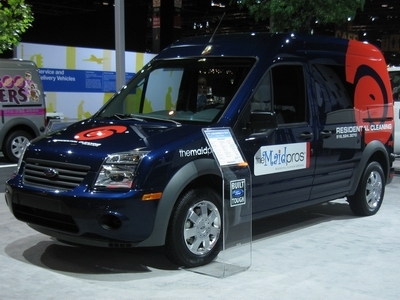 She knew that Ford’s Transit Connect was the perfect vehicle for her mobile cardiopulmonary resuscitation and first-aid Instruction Company the moment she saw it. Now, she couldn’t be more excited to own one. Buffman performs all of her classes on site – whether the venue is a child care center or assisted living facility. In doing so, she needs to pack everything necessary for a class – like breathing shields, books, and bandages -- along with bulky duffel bags filled with CPR dummies. She’s adamant that her students have the opportunity and the resources to learn – no matter what type of personal challenges that represents. “One unique aspect of my business is I don’t like putting anyone on the spot,” she said. “So I use one dummy per person so they can concentrate on learning the skills and not worry about someone watching them. Most of my classes are about 20 students, so I’m packing 20 dummies right there. And if I’m teaching infant CPR, that’s two dummies – an infant and adult – per person. Jerry’s Transit Connect was customized with more open storage space for the quick ingress and egress to remove the dummies and her gear bags. [xfloat=left]http://www.cleanmpg.com/photos/data/507/Transit_Connect_-_Matt_Wade_-_10-mile_Creek_2.jpg[/xfloat]Ten Mile Creek Kayak -- Frisco, CO.
For Matthew Wade, starting a kayak business was a dream come true. Now Wade, owner of Ten Mile Creek Kayak, says that winning a Transit Connect is just the icing on the cake. The business that he started in May is thriving, he said, and having a customized vehicle will help him expand – allowing him to travel further while promoting his business at the same time. Matt’s Transit Connect was outfitted with Kayak clothing storage in mind and done so everything he needs can be carried in one trip vs. two previously. [xfloat=left]http://www.cleanmpg.com/photos/data/507/Maid_Pros_2.jpg[/xfloat]The Maid Pros -- Woodbury, NY. Omar Herrera, owner of The Maid Pros residential cleaning service is thrilled about winning a new Ford Transit Connect. Growing a start-up business can be tough. You need to get the word out to the people who need your services, and that’s not always easy. Herrera has big plans – expanding his business, adding more staff. The Transit Connect, he said, will help pave the way. Omar’s Transit Connect was equipped with shelving to hold cleaning supplies of all sizes and types plus home cleaning tools of the trade including vacuum cleaners, mops and buckets. Ford’s Transit Connect -- It drives like a car, works like a van and is as tough as a truck. The compact Transit Connect includes over 143 cubic feet of cargo space and nearly limitless opportunities for customization. More than 600,000 Ford Transit Connects have been sold to customers in 58 countries and on four continents since 2003. 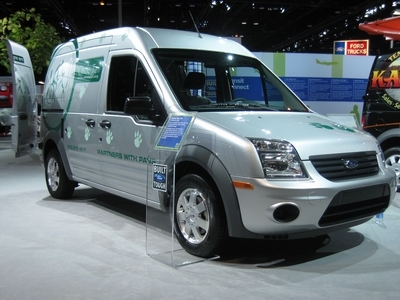 To fulfill the needs of small business owners in the United States, Ford’s Global Product Development team quickly adapted the Transit Connect for the American market. Transit Connects capability begins with its capacity. Split rear cargo doors open at a standard 180 degrees, or an optionally available 255 degrees. When open, these doors provide access to 52.1 inches of available load height. Lift-over height is less than two feet, when the Transit Connect is unloaded. Once inside, the cargo area opens up to 59.1 inches of floor to ceiling load height. The load width is 47.8 inches, between the wheel arches. Load length is a generous 72.6 inches or more than six feet of cargo floor space. Dual sliding rear side doors provide wide access to the generous cargo space as well. Commercial users are provided a cargo payload of 1,600 pounds. The Ford Work Solutions is an in-dash computer that allows small business owners to run their enterprises from inside the Transit Connect. Applications include downloading customer or product information, remotely accessing an office work station computer, sending and receiving text messages, navigating job or delivery locations with the Garmin navigation function and connecting with customers via hands-free cel phone functionality. With a bright touch screen, for easy use and visibility, the in-dash computer runs the Windows CE 6.0 operating system. Word processing, spreadsheet, calculator and calendar applications are all included. With applicable subscriptions, the system can provide users with Internet access, remote document access and Garmin Online services such as traffic, weather and fuel prices. The in-dash computer enables the availability of Tool Link, by DeWalt™. Using Radio Frequency Identification (RFID) tags that adhere to the tools or objects themselves, Tool Link allows the Transit Connect Cargo to be scanned for the appropriate tools and inventory items, prior to leaving for the jobsite or route. In addition, Tool Link can verify that these tools or items are secure at the end of the day and available for tomorrow’s next job. Crew Chief™ is a tool for fleet managers to track vehicles, staff and Transit Connect diagnostics. This system, not available in conjunction with the in-dash computer, provides a fleet manager with the ability to track a given vehicles location, speed, idle time, fuel usage and more than 30 diagnostic measures. Functions and reporting can be tailored to meet the specific needs of fleets large or small. Crew Chief has “geo-fencing” capability, allowing a fleet manager to set geographic or time of use boundaries. The US version of the Transit Connect will be produced in the European Ford Otosan assembly plant in Kocaeli/Turkey. This plant has already been producing the European Ford Transit/Tourneo Connect product family since its launch in late 2002. Starting at $21,475 including destination, the new to the US Transit Connect may be the next vehicle of choice to a wide range of American small business owners. My 1998 Honda Odyssey gets 28 to 30 mpg consistently. I use it in my vending business and haul lots of stuff on my trips. I don't think that this little van would haul as much and it does not get that great of mileage. The larger (1999 and up) Odyssey will haul even more and still beat the mileage of this litttle Ford. Surely they can do better. I can't speak to comparisons of this type, but I am surely looking forward to the electrified version of the Transit Connect! ___Ford left a lot of FE on the table with the simple 4-speed AT and an ancient Focus motor . What Ford did not leave on the table wrt the Ody is room, FE and especially cost. Ford Transit Connect 135.3 20/24 $21,475 including Dest. Honda Odyssey 147.4 16/23 or 17/25 w/ VCM $27,025 including Dest. Smart advertising dollars spent by Ford. Sure beats Escalade fiascos and Hybrid Sierra ads. Well done to Ford, and OK, so I'll take a look at a Ford, next time. But no promises. The Vehicle I thought of when I saw this was the HHR panel van which is rated at 21/30 with the 2.2 and a stick. HHR has a much smaller cargo capacity and much lower price though ~17K. Is this intended to replace the Econoline van? In that case we should compare it to the Dodge/Mercedes Sprinter which is much larger and and more expensive ~35k. ___This is a vehicle that gives the small business owner large storage cap for a minimal price. The HHR is a much smaller vehicle. The Sprinter is almost double the price so that it not workable solution for many small business’ either. ___I wish Ford would have used a modern 5 or 6-speed and the latest engine tech as they gave up 5 + mpg but again, these things were equipped nicely after up fitting and for a price nothing in the marketplace can touch that I know of. Let alone the totally unacceptable FE of the full sized vans that the Transit Connect can compete against with its tall platform. I guess I did not think too much about price. I bought my 1998 Odyssey last May when the fuel prices were going up and up. I only paid $3900 for it and it was in like new condition even though it had about 120,000 on the odometer. It now has 164,000 on it with no repair expense. At the time I bought it I looked at a 2006 Scion XB that had 62,000 miles on it but it was in such rough shape I would not consider it. Most of the bolts under the hood were so corroded that it would have been hard to work on. I had wondered if the battery had exploded in it. Sounds like a flood vehicle. On any given day, Jen Kiblinger has up to 60 dogs in her life, with many being shuttled between training classes, foster homes and rescue shelters. And that's where her new 2010 Ford Transit Connect will serve her well. As president of Circle Tail Inc., a nonprofit organization in Pleasant Plain, Ohio, Kiblinger trains assistance dogs for people with mobility, hearing, neurological and psychiatric disabilities. "My dogs can be on the road for up to two hours, and I need them to be safe, secure and comfortable," Kiblinger said. "My new Transit Connect will be great for transporting them in style." On Friday, Sept. 18, Kiblinger will receive the keys to the fuel-efficient Ford Transit Connect panel van at the Second Annual Golf Classic in Pleasant Plain, a fund-raising event to support Circle Tail's new 7,200-square-foot dog training facility and renovate its kennels. 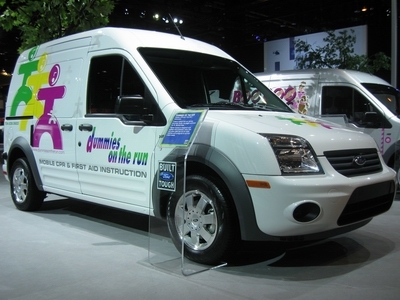 Ford's Transit Connect went on sale in the United States in July and is enjoying brisk demand. The first full month of sales topped 2,000 units and vehicles are selling in fewer than 10 days of arrival on dealer lots, significantly quicker than industry norms. "The Transit Connect is ideal for small business owners who – until now – have not had a vehicle designed just for them," said Damoni Hurt, marketing manager, Ford Transit Connect. "Now, entrepreneurs like Jen Kiblinger have a vehicle that will help them be more efficient in their day-to-day operations." Kiblinger also is excited about the visibility Transit Connect will bring to Circle Tail. Her organization's logo and contact information is stamped on the exterior of the van. "The vehicle is very eye-catching," said Kiblinger. "It will help us get our name out in the community. And that's a huge thing." With a cargo capacity of 135 cubic feet, compact maneuverability, and fuel efficiency of 22 mpg city and 25 highway, Transit Connect is the perfect vehicle for a small business on the go. "We have up to 60 dogs in training at any one time and it seems like we're always unloading and loading the dogs, along with all the supplies that go with them – collars, leashes, toys, dog food and all that," said Kiblinger. Circle Tail Inc., founded in 1997 by Marlys Staley, also handles dog adoptions and provides obedience training and boarding. It's one of those rare entities that benefits both people and animals, said Kiblinger. "There's never been a time when I didn't love animals," she said. "And Circle Tail offers the best of both worlds – helping animals while helping people, too. We provide assistance dogs at no cost to the individual, and we offer services to strengthen the human/canine bond, so dogs are more likely to stay with families instead of being given up." The organization works with area prisons on dog training. Inmates, schooled by Circle Tail in dog training, learn accountability and responsibility, and the dogs thrive on the extra attention. "Some of the stories you hear from the prisons are amazing," said Kiblinger. "This really helps normalize the inmates' lives. And they're great with the dogs." All those trips back and forth in the group's old minivan took their toll. The Ford Transit Connect, said Kiblinger, is the perfect solution – from its size to its maneuverability. "This is wonderful," she said. "We couldn't believe that we'd actually won!" Circle Tail's Kiblinger is one of five small business owners from around the United States to win a customized Transit Connect in Ford's "Connect with Connect" contest. I'm getting one in a couple of days. When my previous minivan's transmission died (after 15 years of reliable service) I went looking and came up with the TC as the most efficient & cost-effective replacement. The overall design is an absolute winner for tradespeople and commercial applications that would otherwise use a conventional minivan or a larger van. There are a lot of little details that show that Ford put a lot of thinking into this one. I'll be posting fuel efficiency performance as soon as I have some numbers to report.